Why pay $5 for a tiny bag of beef jerky that's been sitting on that gas station shelf since the Carter administration? Just because it looks like leather doesn't mean it has to taste like it. Instead, make your own delectable dried-out meats using nothing more than an oven. Advanced warning: this takes some time. 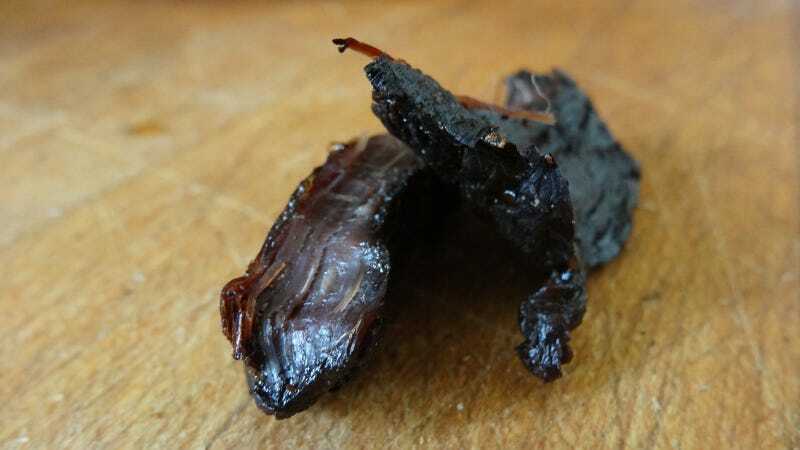 But by the end, you'll have yourself some of the best-tasting jerky of your life, without forking over a few hundred bucks for a dehydrator. Meat: Doesn't matter what kind of meat—you can use anything from steak and poultry to salmon and tuna to, theoretically, iguana or other exotic fleshes—just make sure it's the best quality you can find. The better your meat, the better your jerky. For the purposes of this demonstration, I'm using a pair of 1 pound hanger steaks sliced across the grain into short, 1/2" thick strips. Equipment: You'll need a gallon-size ziploc bag for the marinating process, a sufficiently large wire rack on which to place the meat as it dries, and optionally, a pan to sit under the rack and catch any drippings. I also lined the bottom of the pan in foil because lazy. As long as you can pour liquids into a bag, handle raw meat, and are competent around an oven, there should be no issues. Mix your ingredients in a gallon ziploc bag and toss in between 1.5 and 2 pounds of beef. The Worcestershire and soy sauces should be used in equal proportions to cover the meat but there's no specific measured volume necessary. Give the bag a shake to coat everything, press all the air out, seal it up and toss it in the fridge for 24 to 48 hours. After time is up, preheat your oven to 200 degrees F, remove the meat from the bag, and spread it out on the wire rack. Place the rack in your oven, set the timer for 4 hours and go about your business. When the timer goes off, you're halfway there; flip the meat over and set the timer for another 3 hours. At the end of the second phase, try a piece of jerky. It should be dark brown on the inside, tough without any sort of sort of springiness. If your meat is still the slightest bit pink, give it another hour or so before checking again. Once the meat is thoroughly desiccated, remove it from the oven and let cool before eating. Delicious! There's always Jack Links. It fills you up because you're swallowing your pride with every bite.